Samsung Galaxy S5 Neo expected price in India is ₹29,999. In an age and time of Galaxy S6 and its numerous variants, the new Galaxy S5 Neo indeed sounds and feels like a blast from the past. The handset retains the original Galaxy S5 design and went official on Korean manufacturer’s Brazilian website as Galaxy S5 New Edition. 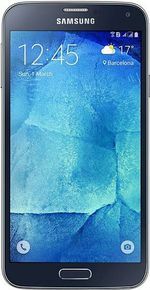 Software is Android 5.1 Lollipop based touchwiz UI, while other notable features include 4G LTE-A / 3G HSPA+ up to 42 Mbps, Wi-Fi 802.11ac (2X2 MIMO), Bluetooth v4.0 LE, GPS, Fingerprint sensor, Heart rate sensor and a 2800 mAh battery. Will new guts in old casing work for Samsung? Perhaps if the price is right. Consumers surely won’t be willing to pay a premium for a phone that resembles 1 year old flagship, even with refreshed internals. Samsung S5 Neo is expected to hit retail shelves in India sometime later and the expected lowest price of Samsung Galaxy S5 New Edition should be around 30k. There is no official word regarding when you can buy Galaxy S5 New Edition online or Galaxy S5 New Edition price.